Kids Prefer Cheese: Whoops I did it again! You know who really won Tuesday's Presidential election? 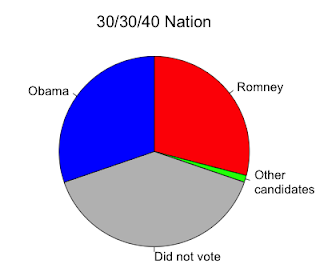 More people (myself included) voted for Nobody than for any other candidate. These results show that Nobody has a clear mandate. Wouldn't it be great if Nobody showed up for the inauguration? Hat tip to Andrew for the great pie chart. Labels: I like to go with the winner, politics, who's on first? So we have a fairly longstanding model of voting turnout in economics that says that people don't vote because the marginal cost is more than the marginal (instrumental) benefit and any expressive benefit. Then you want to take the empirical data showing how many people don't vote and claim that not voting is revealed preference about the candidates. In other words, "Nobody" has significantly declined in the past two (maybe three) elections, with much clearer mandates in the past. If Demand is Too High....Charge LESS!